Country in Asiatic Turkey. 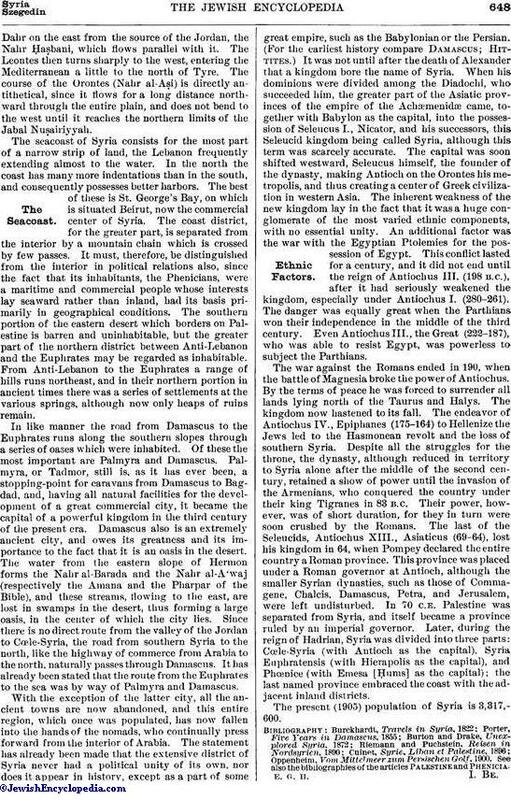 The terms "Syria" and "Syrians" do not occur in Hebrew; they are found first in the Greek period. FollowingNöldeke, these terms are usually explained as abbreviations of "Assyria" and "Assyrians." The identity of the two names is affirmed by Herodotus (vii. 63), who regarded "Assyrians" as the barbarian form, and "Syrians" the Greek spelling. The name "Syrians" has recently been derived by Winckler (in Schrader, "K. A. T." 3d ed., pp. 27 et seq.) from the "Suri" mentioned in the cuneiform inscriptions as a Babylonian designation for "the West," including Mesopotamia, northern Syria, and Asia Minor as far as the Halys—regions which had been inhabited by Arameans since the middle of the second millennium. In the Septuagint "Syria" is used to translate the Hebrew "Aram." In a political sense the name "Syria" denotes the empire of the Seleucids, the territory implied varying with the boundaries of their dominions; for the great Syrian kingdom, whose capital originally was Babylon, and then Antioch on the Orontes, had no essential unity, but lost one district after another, until, in 65 B.C., Pompey made the remnant a Roman province which corresponded in general to the Syria of the ancient and modern geographers. Strabo, Pliny, and Ptolemy give the boundaries of Syria as the Taurus on the north, the Arabian desert on the south, the Mediterranean on the west, and the lower portion of the Euphrates and the region now called the Syrian desert (but anciently termed the Arabian desert) on the east. The southern portions of this region, Arabia Deserta and Petræa, as well as Palestine, did not belong to the Roman province of Syria, but formed independent districts. The term "Syria" now includes the district which lies to the east of the Mediterranean, between Egypt and Asia Minor, and stretches from the coast to the desert. Whether this desert, the great Syro-Arabian desert, called the Hamaḍ (the Arabia Deserta of the ancients), is to be regarded as a part of Syria or Arabia is a question of minor importance. The boundaries of Syria are essentially natural ones: the Mediterranean on the west, and the desert on the east and south, although the desert forms no hard-and-fast limit, since the area available for habitation and cultivation has varied at different times. Since early times it has been a problem, as it still is, whether even a strong government could protect the peasants that cultivated the land on the desert frontiers against the predatory attacks of the war-like Bedouins. When such protection could be given, the arable districts increased in extent; but when the reverse was the case, the desert gained, or, in other words, the nomads forced the peasants to withdraw. Thus, during the Roman period the Ḥauran (comp. Palestine) had many flourishing villages and a large population, while under Turkish dominion it has fallen into the hands of the nomads and become desolate. Only within the last two decades has the Turkish government assumed control in the border districts and placed certain localities under military control, thereby making a distinct change for the better and driving the Bedouins farther back. The northern boundary is formed by the great Taurus range that runs from west to east, from Lake Van to Cilicia Trachea, where it slopes down to the Mediterranean. In the northwest, Syria is separated from eastern Cilicia, or Cilicia Campestris, by the chain anciently known as the Amanus, which runs northeast, from the northeast corner of the Mediterranean (the Gulf of Issus) through the Taurus. This range, however, has several easy passes, so that Cilicia Campestris, even as far as the Taurus, was always influenced by Syrian civilization. The region bounded by these limits never formed a political unit, and it had a history only so far as it formed a part of some greater country. In civilization, on the other hand, it was one, for this entire region was under the immediate and powerful influence of Babylonia and Assyria, which had impressed their own characteristics on the culture of all these lands. This district is marked geographically by a system of dips running through the entire region from north to south. The "great Syrian dip" begins in the valley of the Ḳarasu, north of the ancient Antioch, and traverses the valleys of the Orontes (Nahr al-Aṣi) and the Leontes (Nahr al-Liṭani). Between Lebanon and Anti-Lebanon the upper courses of both these rivers lie in the depression now called Al-Biḳa' and corresponding to the ancient Cœle-Syria. The dip then sinks quickly, with the Jordan valley, below the level of the Mediterranean, reaching its greatest breadth and depth (793 meters below sea-level) in the Dead Sea. From that point it rises again to the 'Arabah, but it may nevertheless be traced as far as the Gulf of Aila. This dip, caused by the faulting of the great cretaceous layers bounding the Syrian desert, divides the land geographically into two sections, the mountain-ranges in both running for the most part parallel with it. The deepest depression is reached in the Dead Sea, while the mountains attain their highest point in Lebanon and Anti-Lebanon, the former on the west and the latter on the east of the great dip, being separated by the plain of Al-Biḳa'. The highest peaks of Lebanon are the Jabal Makmal (3,052 meters) and the Ḍahr al-Ḳuḍib (3,063 meters), both east of Tripoli, while the highest point of Anti-Lebanon is Mount Hermon (2,860 meters). In the north, the Lebanon range ends at the Nahr al-Kabir, being continued beyond this plain by the Jabal Nuṣairiyyah, while beyond the valley of the Orontes rise the mountains anciently known as the Amanus, although they have no generic modern name. In the south, Lebanon finds its continuation in the west-Jordan hill-country of Palestine, but on the east of the great depression the chain of Anti-Lebanon comes to its northern terminus south of the Lake of Ḥums, the valley of the Orontes being marked by only slight elevations. Southward, however, the east-Jordan plateau shows considerable elevations (comp. Palestine). The valley between the two halves has been fully described, so far as its lower portion, the Jordan valley, is concerned, in the article Palestine. The northern part, the fertile district of the ancient Cœle-Syria, has its watershed at Baalbek. In this vicinity arise the two great rivers which drain the plain. The Nahr al-Liṭani, the ancient Leontes, flows southward, and is separated by the chain of the Jabal al-Ḍahr on the east from the source of the Jordan, the Nahr Ḥaṣbani, which flows parallel with it. The Leontes then turns sharply to the west, entering the Mediterranean a little to the north of Tyre. The course of the Orontes (Nahr al-Aṣi) is directly antithetical, since it flows for a long distance northward through the entire plain, and does not bend to the west until it reaches the northern limits of the Jabal Nuṣairiyyah. The seacoast of Syria consists for the most part of a narrow strip of land, the Lebanon frequently extending almost to the water. In the north the coast has many more indentations than in the south, and consequently possesses better harbors. The best of these is St. George's Bay, on which is situated Beirut, now the commercial center of Syria. The coast district, for the greater part, is separated from the interior by a mountain chain which is crossed by few passes. It must, therefore, be distinguished from the interior in political relations also, since the fact that its inhabitants, the Phenicians, were a maritime and commercial people whose interests lay seaward rather than inland, had its basis primarily in geographical conditions. The southern portion of the eastern desert which borders on Palestine is barren and uninhabitable, but the greater part of the northern district between Anti-Lebanon and the Euphrates may be regarded as inhabitable. From Anti-Lebanon to the Euphrates a range of hills runs northeast, and in their northern portion in ancient times there was a series of settlements at the various springs, although now only heaps of ruins remain. In like manner the road from Damascus to the Euphrates runs along the southern slopes through a series of oases which were inhabited. Of these the most important are Palmyra and Damascus. Palmyra, or Tadmor, still is, as it has ever been, a stopping-point for caravans from Damascus to Bagdad, and, having all natural facilities for the development of a great commercial city, it became the capital of a powerful kingdom in the third century of the present era. Damascus also is an extremely ancient city, and owes its greatness and its importance to the fact that it is an oasis in the desert. The water from the eastern slope of Hermon forms the Nahr al-Barada and the Nahr al-A'waj (respectively the Amana and the Pharpar of the Bible), and these steams, flowing to the east, are lost in swamps in the desert, thus forming a large oasis, in the center of which the city lies. Since there is no direct route from the valley of the Jordan to Cœle-Syria, the road from southern Syria to the north, like the highway of commerce from Arabia to the north, naturally passes through Damascus. It has already been stated that the route from the Euphrates to the sea was by way of Palmyra and Damascus. With the exception of the latter city, all the ancient towns are now abandoned, and this entire region, which once was populated, has now fallen into the hands of the nomads, who continually press forward from the interior of Arabia. The statement has already been made that the extensive district of Syria never had a political unity of its own, nor does it appear in history, except as a part of some great empire, such as the Babylonian or the Persian. (For the earliest history compare Damascus; Hittites.) It was not until after the death of Alexander that a kingdom bore the name of Syria. When his dominions were divided among the Diadochi, who succeeded him, the greater part of the Asiatic provinces of the empire of the Achæmenidæ came, together with Babylon as the capital, into the possession of Seleucus I., Nicator, and his successors, this Seleucid kingdom being called Syria, although this term was scarcely accurate. The capital was soon shifted westward, Seleucus himself, the founder of the dynasty, making Antioch on the Orontes his metropolis, and thus creating a center of Greek civilization in western Asia. The inherent weakness of the new kingdom lay in the fact that it was a huge conglomerate of the most varied ethnic components, with no essential unity. An additional factor was the war with the Egyptian Ptolemies for the possession of Egypt. This conflict lasted for a century, and it did not end until the reign of Antiochus III. (198 B.C. ), after it had seriously weakened the kingdom, especially under Antiochus I. (280-261). The danger was equally great when the Parthians won their independence in the middle of the third century. Even Antiochus III., the Great (222-187), who was able to resist Egypt, was powerless to subject the Parthians. The war against the Romans ended in 190, when the battle of Magnesia broke the power of Antiochus. By the terms of peace he was forced to surrender all lands lying north of the Taurus and Halys. The kingdom now hastened to its fall. 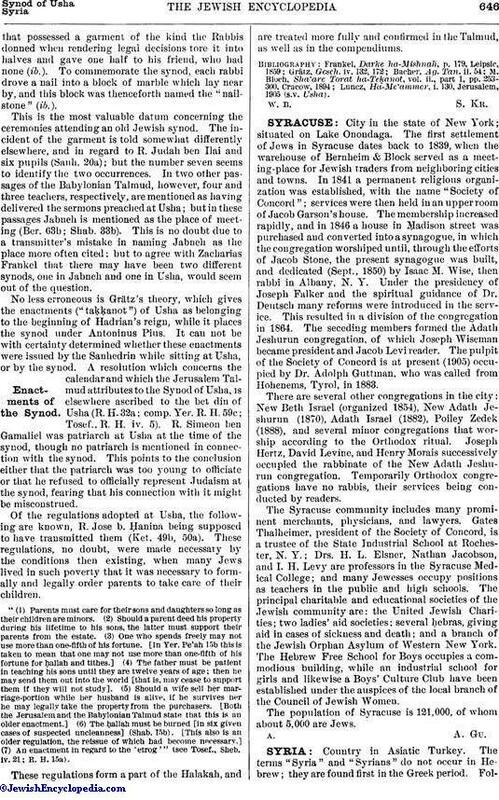 The endeavor of Antiochus IV., Epiphanes (175-164) to Hellenize the Jews led to the Hasmonean revolt and the loss of southern Syria. Despite all the struggles for the throne, the dynasty, although reduced in territory to Syria alone after the middle of the second century, retained a show of power until the invasion of the Armenians, who conquered the country under their king Tigranes in 83 B.C. Their power, however, was of short duration, for they in turn were soon crushed by the Romans. The last of the Seleucids, Antiochus XIII., Asiaticus (69-64), lost his kingdom in 64, when Pompey declared the entire country a Roman province. This province was placed under a Roman governor at Antioch, although the smaller Syrian dynasties, such as those of Commagene, Chalcis, Damascus, Petra, and Jerusalem, were left undisturbed. In 70 C.E. Palestine was separated from Syria, and itself became a province ruled by an imperial governor. Later, during the reign of Hadrian, Syria was divided into three parts: Cœle-Syria (with Antioch as the capital), Syria Euphratensis (with Hierapolis as the capital), and Phœnice (with Emesa [Ḥums] as the capital); the last named province embraced the coast with the adjacent inland districts. The present (1905) population of Syria is 3,317,600. Oppenheim, Vom Mittelmeer zum Persischen Golf, 1900. See also the bibliographies of the articles Palestine and Phenicia.